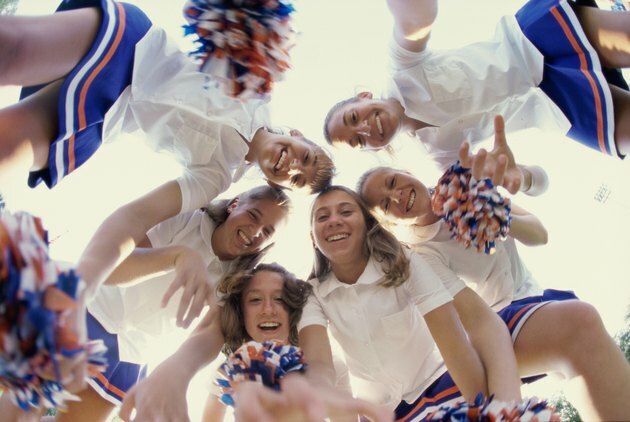 Cheerleading is an effective way to stay in shape and show team spirit. It requires dedication, skill, technique, strength and flexibility, according to former national all-star cheerleader Leslie Wilson in her book. “The Ultimate Guide to Cheerleading.” Your team can create basic cheerleading routines that are unique to your squad by putting some thought into how your chant and motions connect with the crowd. Some of the most important factors are beat, easy to remember words and excitement that compels your fans to get on their feet and show team spirit. Find a beat you like. Use a popular song or create an easy beat using a eight-count. Enlist a percussionist who is willing to tap out the beat until your team learns the routine. The drum beat can help your squad follow the beat faster as long as the beat isn’t louder than the cheer. Add words to your beat. The words don’t have to rhyme, but rhyming can help the squad and fans learn the cheer faster. The words can be geared to a specific sport or a general cheer that your squad can use for any type of sport in which your school participates. Write down the words and edit them as needed to create the most effective cheer. Choose motions that go with the words of the cheer. For example, when spelling out the word “spirit,” you can use a touchdown motion for the “I’s” and a “T” position for the “T’s.” Cup your hand at the ear when you say, “Let’s hear it!” A toe touch jump is an effective movement for “yeah” or “big.” If your team mascot is a cat of some type, you can use a claw hand motion when you say your team name or when you roar like the cat. Use the same motions for the same words to keep the cheer simple and clue the fans in so they can say the cheer with you. Make your motions snap and maintain the beat, keeping things clean and controlled to remain safe. Demonstrate the complete cheer before you begin demonstrating it to the squad. Begin by clapping out the beat or having your percussionist tap it out through one time. Perform the entire cheer from different angles so your squad can identify the motions easily and see how they transition from one to the next. Repeat the cheer line-by-line without the motions and then walk the squad through the cheer one line at a time as they follow along. When they have the words and basic motions down, you can add stunts, such as pyramids, tosses and tumbles, according to the strengths and skills of your squad members. Complicated may look awesome, but if you choose stunts too difficult, you increase the risk of injury.